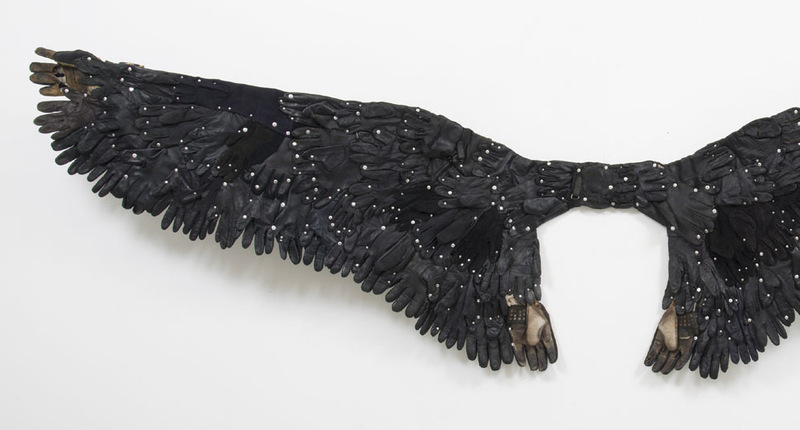 Working with repurposed objects like aluminum cans and old gloves, artist Paul Villinski (previously) explores themes of flight, environmentalism, as well as addiction and recovery. His primary muse has taken the form of butterflies rendered in multiples as they swirl across walls, or carefully organize into shapes (fun fact: a group of butterflies is called a kaleidoscope). I’m not alone in this: from Leonardo to Lindbergh to Lenny Kravitz, the desire to “fly away” has had a grip on our collective imagination for millennia. Now and then, I have the extraordinary luck to spend a few hours floating along on currents of warm air, the earth’s surface slipping silently by, the mundane anxieties of daily life thousands of feet below the long, white wings of my glider. Back in the studio, I wish I could bring everyone I’ve ever met along in the tiny cockpit of my sailplane. Instead, I look for forms to describe the longing to enter the sky, to get us all aloft, even from within the confines of the gallery. You can see Villinski’s current exhibition Departure at Jonathan Ferrara Gallery in New Orleans through December 26, 2015.